Have you ever ordered a restaurant salad with high hopes of chowing down on a huge bowl of greens and instead, get a measly amount of veggies swimming in a pool of dressing? How they think this is appealing is beyond me. Well, this salad is the complete opposite to that. It’s loaded with greens, it’s packed with nutrients, and you don’t need a rubber dinghy to make your way across your plate. It’s the Queen of all salads, The Mack Daddy of them all. I wondered the same thing when I had it for the first time at One Lucky Duck in New York – a restaurant that goes against the dainty restaurant salad crowd. 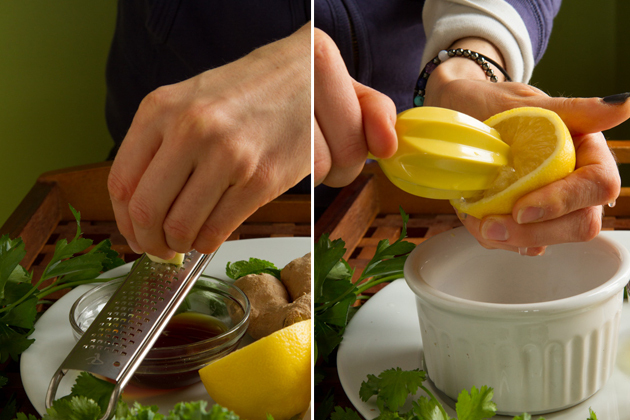 It was like magic on my taste buds – the lemon, healthy oils, fresh herbs… the… mint? Mint in a salad? Weird. Who else is totally boggled by this concept? I know that I was! But it works so perfectly here, I wouldn’t have it any other way. And, remember the vegan shaved Parmesan that we made earlier this week? Throw it on this baby and you’ll find it hard to stock up on kale fast enough. 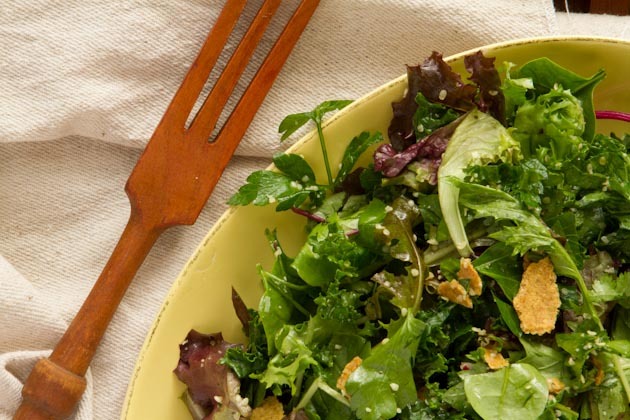 A healthy greens salad made with pumpkin seed oil - an oil with an impressive amount of nutrients and essential fatty acids, and a slew of other good-for-you greens and herbs! 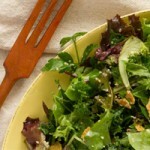 For the salad, rinse the kale under hot water for 30 seconds or so to soften up and make it easier on digestion. 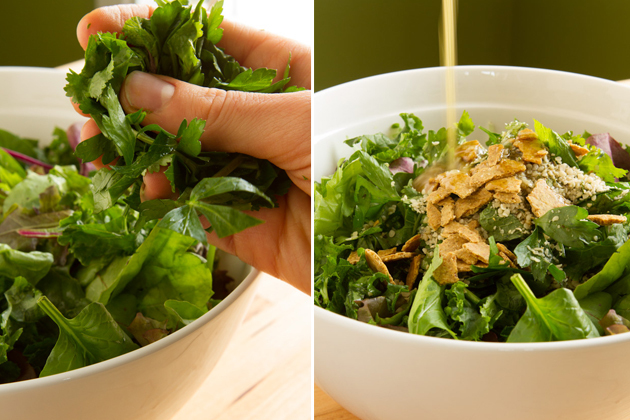 Chop fresh herbs and add all salad ingredients to a large bowl. 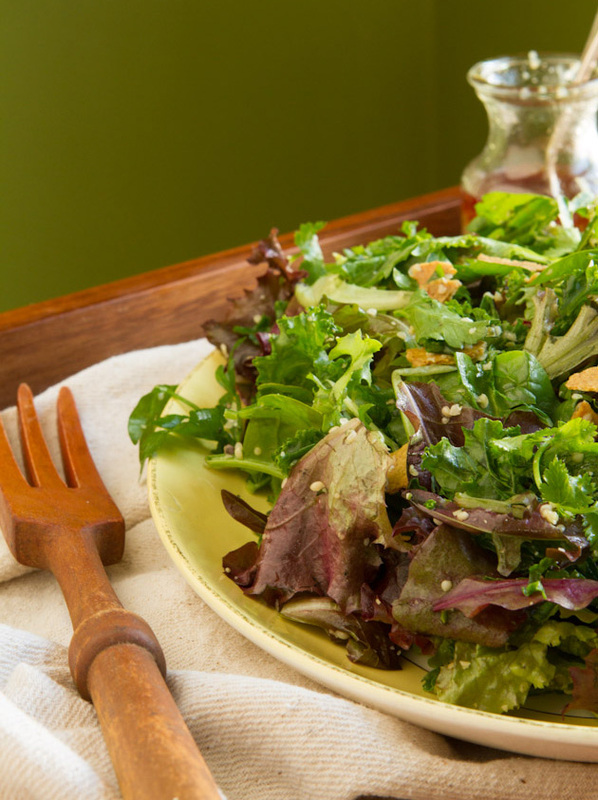 For the dressing, add all ingredients to a jar, shake and pour over your salad. This recipe is for 1 serving of salad. Feel free to double, triple or quadruple up if needed (I highly recommend it!) If you cannot find kale, any green will work. If you cannot find pumpkin seed oil, choose another omega-rich oil like flax seed oil or hemp seed oil. Alternatively, you could use a high quality olive oil. Hemp seeds can be replaced with any seed you'd like - pumpkin, sunflower, etc. If you do not want to make the Parmesan, just sub out with 2-3 tablespoons of nutritional yeast flakes added right to the salad. The fiber-related components in kale do a better job of binding together with bile acids in your digestive tract when they’ve been steamed. When this binding process takes place, it’s easier for bile acids to be excreted, making it easier to digest. 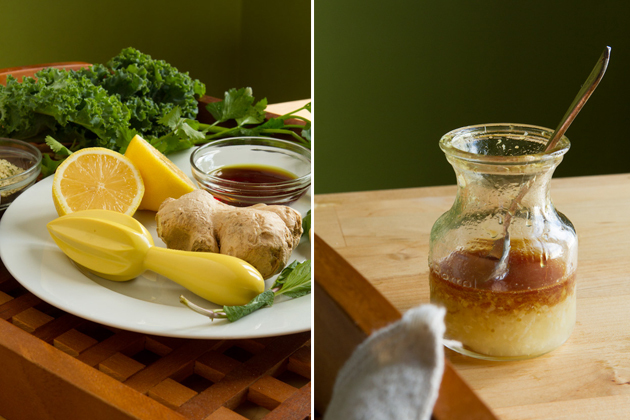 I like to begin by making the dressing and setting it aside for the flavors to develop. This dressing just gets better with age. 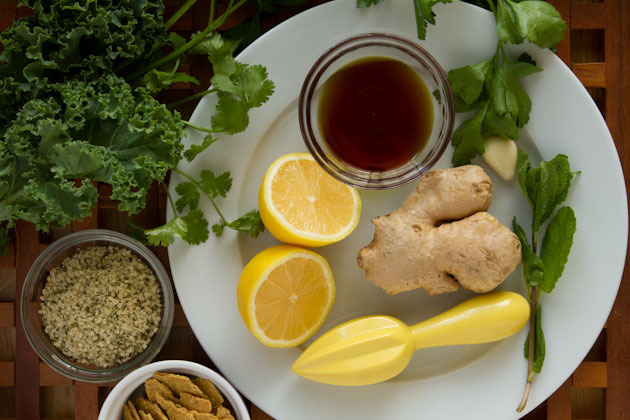 Cilantro (great for cleansing), parsley (antioxidants), mint (benefits your digestion) have major super power abilities, so don’t skimp on the fresh herbs here. Load ‘er up!